When you search, you’ll be rewarded with PRE crypto tokens. You will earn 0.25 PRE tokens per search, up to 32 searches per day (8 PRE tokens). Join using my link and earn 25 extra PRE tokens! 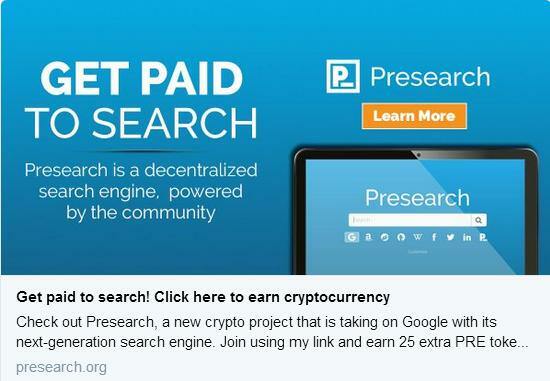 Great article about Presearch: "8 reasons PRE is brilliant for every crypto portfolio"
"Presearch is excited to announce that the PRE token is now supported in the Coinomi wallet, enabling more than 1.5M users to store and transfer their Presearch tokens." Presearch was featured on Nasdaq Live! Add your favorite search providers to Presearch NOW! Don't know how? => Just read this article/watch the video for a detailed, step by step explanation!